“It has been a long time since I have been this excited about a new piece of kit. The Zelter Shelter truly has impressed me and I am very grateful to Lee for all his hard work he put in to creating the shelter. 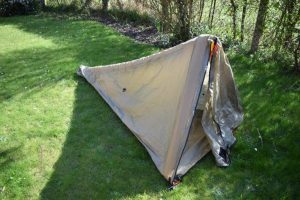 Zelter Shelter is also available in a non wearable tent version. The Real Survivalists, a UK-based survival and prepping site have picked up a Zelter Shelter and done a really comprehensive review. It’s great to see people putting them through their paces and loving it. Check out their review below – it’s the most in-depth I’ve seen yet. Check out their site for great articles and gear reviews – they’re also starting up a shop for survival gear and tools, so keep your eyes on them and you might find some new Zelter gear and exclusives appearing. In the meanwhile, Rob from The Real Survivalists got on just fine with all the Zelter Shelter’s functions and he’s spreading the word.